Good morning from my porch in Paonia … there’s just a bit of a chill. 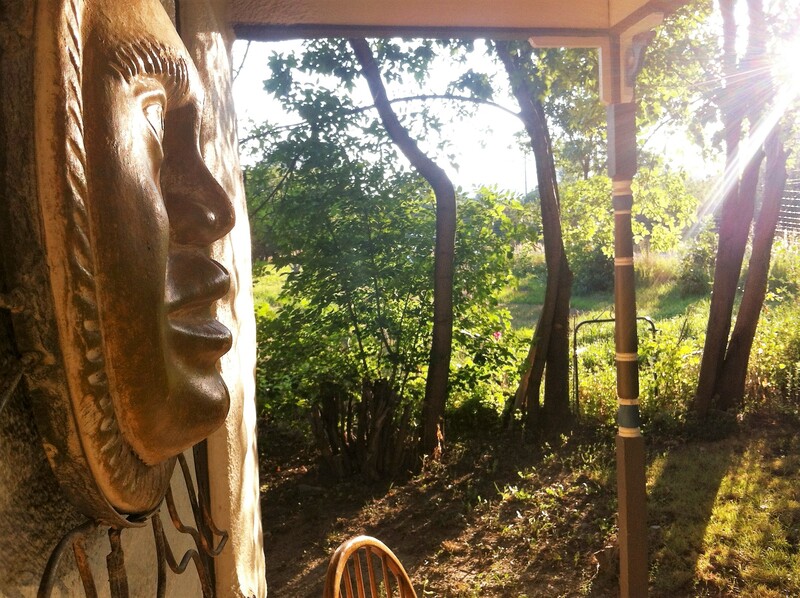 Sit and face the sun, breathe in birdsong, and train whistle. Coffee. 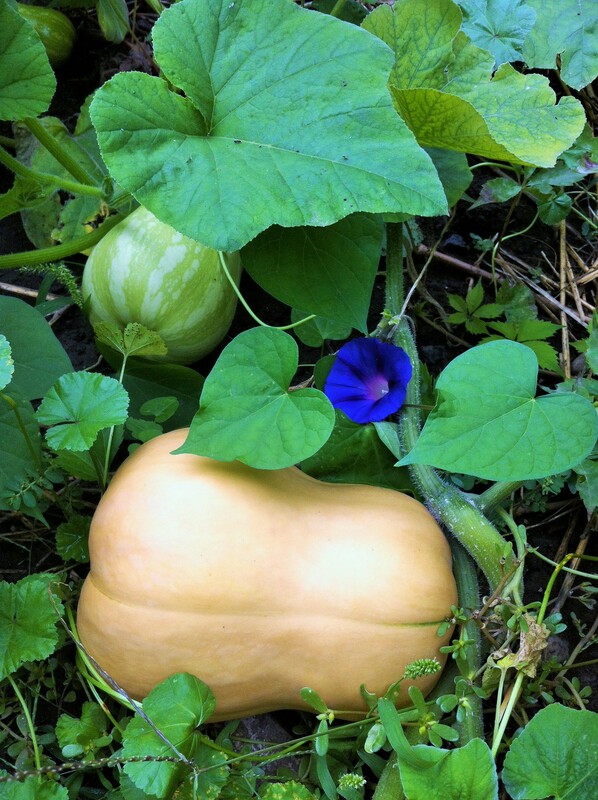 I can imagine the winter squash ripening … not in my garden this year, but just like this photo from the 2012 patch. I have to say, growing squash gives me a deep, satisfying joy. They shoulder the deluge of sun. from the steaming blacktop road. emerges. They stand now, brush wrinkled cotton. are planted in the earth. among people who remain unchanged. at me. Her look is calm strength. In 2015, I live on a little road called Peony Lane, just outside of town. Here and there, daisies in the ditch do nod and sway. But my favorite now is the huge trumpet vine. A Perennial. A little taste of permanent. With the fleeting whir of hummingbirds zooming about, swoop of wasps, or plunge of bees into the flowers’ glowing caverns – just to keep things lively. I had a butternut squash, a can of coconut milk, and a friend to make lunch for the other day. Try this sweet and spicy soup. It’s a wonderful treat now, and even more so come winter. Preheat oven to 425. On a heavy baking sheet, drop a dollop or two of coconut oil. I prefer the fragrant, coconutty kind for a recipe such as this. Place baking sheet in the oven to heat and the oil to melt. Halve, clean and roast squash cut side down on the baking sheet about 45 minutes, until very tender. Cool. When cool enough to touch, scoop flesh from the squash skin, and puree in a food processor, adding a splash of water if necessary to blend. In a large soup pot, place another dollop of coconut oil, and melt over medium heat. Add mustard seed and garlic, watching carefully so you catch the garlic just as it’s beginning to turn golden, and the mustard seeds start to pop. Pour in coconut milk. Add miso and pureed squash. Whisk to blend, stir in seasonings and taste. If you like the soup a bit thinner, stir in a little more water, or use a broth if you like. Lower heat to simmer, and stir occasionally as the flavors blend. Spicy soup uplifts your outlook, don’t you think? Brightens the heart and warms the spirit. Scatter with minced fresh chives to serve, and be prepared to smile. It’s a funny thing, choosing to be a chef – a study in impermanence if there ever was one – arranging delicious food on a plate, ladling joyful soup into a bowl – here one minute, gone the next. It’s one ongoing way to love each other deeply! Enjoy! Whoops! Need more squash recipes? Try these from Pachamama’s archives. Looks fabulous, great colours. 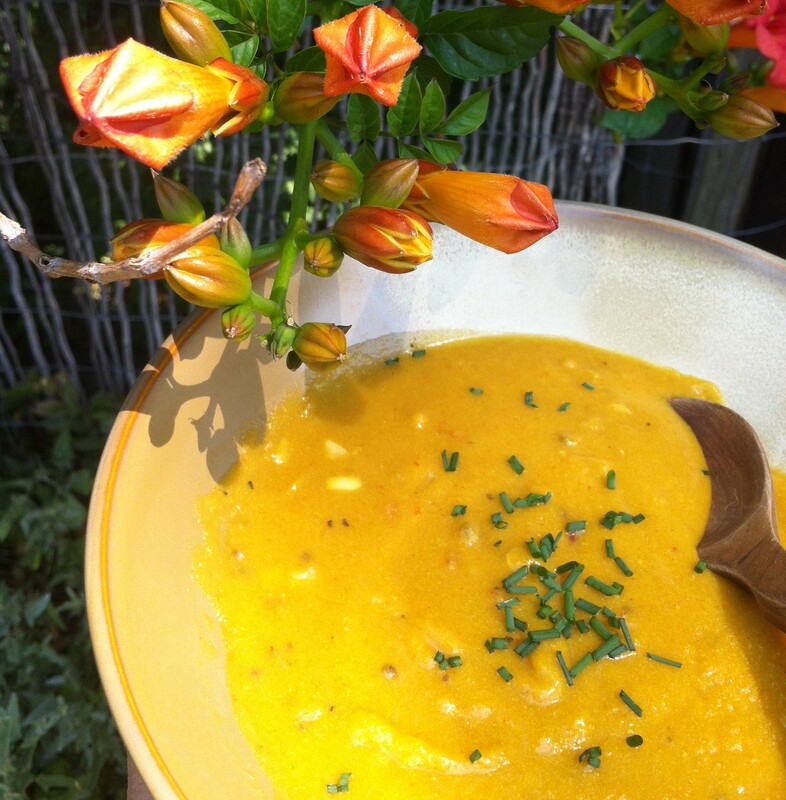 I love making soup from butternut squash and curry spices; perfect for an autumn evening. It is a fine combination of flavors, glad you’ve discovered, too – and the oranges and golds are some of my favorites. Thanks for stopping by! That’s fantastic, Sandra! Do you have a big garden? I imagine the climate where you live is perfect for growing conditions. Thanks so much for your kind words, I’m glad you enjoyed my poem and post! Blessings!